Many people will be enjoying an extended weekend thanks to Memorial Day. With more time off comes more gaming. There are a handful of gaming companies having Memorial Day weekend sales. This weekend might be your chance to put some of those Steam gift cards to good use. If you haven’t won yet, be sure to check out the Weekly Loot every week and comment for your chance to win. Holidays don’t only bring change to real world gaming process. Some MMORPGs go as far as hosting in-game events for certain holidays. Whether it?s fireworks on Memorial Day, pumpkins and bats on Halloween, or snow on Christmas; something just can?t beat the holidays. The unique feeling people get during the holidays is exactly what developers focus on when rewarding their dedicated fan base. I love the how a holiday event can put a relaxing spin on an MMORPG that can be tedious and stressful at times. Plentiful amounts of side quests keep players active and deliver different levels of difficulty. When everything in an MMO is work toward a greater cause, a laid back event is all it takes sometimes to make a virtual world seem more realistic. Another great aspect of Holiday events or special events in general, is the unique list of items a player comes across. Many times players will hang on to rare items and benefit from their effects in the future. The exclusive gear and items you get during the holidays are often for purely esthetic reasons though. This is more than enough for some players to hang onto special loot. People build holiday memories in a virtual world the same way they do in the real world. I?ll always remember Summerfest in Final Fantasy XI. Sure everyone obtained the same items as I did, but most people threw those items out. I never got rid of my Lord?s Yukata though. It may have been a useless torso item, but I loved how it looked compared to all the dirty low level gear I had been limited to. It was nice to have something to remember the fun times I shared with friends during the event. It was even nicer to be the only one who still owned the gear a year later (I guess I really wanted that gold fish scooping bonus). It was great venturing out with friends toward the same mission. Staying on the same pace with others in an MMORPG can be impossible. It?s great to see exclusive one-time treasures bring people together on the same level, literally. There is just so much to look forward to during a holiday event. Boring aspects of everyday gameplay fade away. Summerfest featured fireworks in the sky at night, contests during the day, and music in areas that would otherwise be barren and silent. Holiday events are fun, just maybe not for everyone. Now let?s be fair here. Hating on an MMO holiday event isn?t the same as hating on a holiday in real life, although many of the same triggers apply. Just as Christmas and Thanksgiving will lead to an influx of shoppers at the local mall, holiday events in gaming will often lead to an influx of players in town. I hate when the main walkways in MMORPG safe havens are cluttered with copious amounts of characters talking to the same NPC. The amount of players logged in during a holiday event can be overwhelming. I may have loved collecting the Lord?s Yukata in the long run, but boy was it everywhere during the actual Summerfest event. Everywhere you turned, someone would be wearing the same blue or pink (depending on gender) body piece. The problem wasn?t even with the fashion trend; it was the fact that you couldn?t find half of the people you were looking for. SpectreX: ?Oh god there?s so many people. Where are you?? Acriens: ?The center of town, near the fountain? SpectreX: ?That?s where I am. I can?t see you. Where are you?? Acriens: ?Wearing blue next to the moogle, near the fountain? SpectreX: ?Everyone is wearing blue, and that?s where I am. Where are you?? Acriens: ?ON THE NORTH WEST RIM OF THE GD FOUNTAIN! 24.4700? NORTH BY 54.3800? EAST. I?M HANGING OUT WITH LOST CATS? 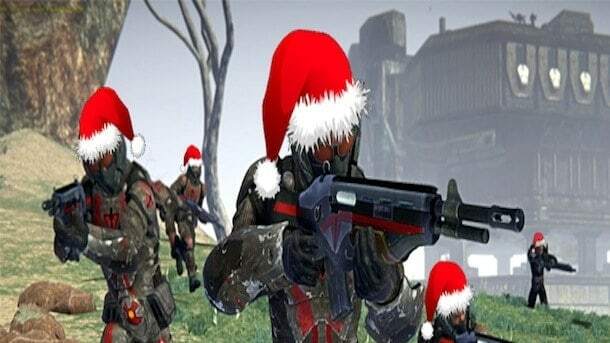 Holidays are under the same paradigm as everything else in MMO gaming. Another one of the most loved experiences can yet again be one of the most hated. It is always up to the individual player to decide. You can choose to focus on the little annoyances of game changing events, or you can enjoy them during their brief existences. After all, the most hated part of many of these holiday events is having to go back to normal, everyday gameplay. Let MMO ATK know what you think about Holiday events in MMORPGs. Do you have any favorites? Check back with Love and Hate in future weeks when I take a look at the individual roles of the holy MMORPG trinity.